Powered Pallet Stacker (Wide Straddle Type) (1 Ton/1.5 Tons/1.8 Tons/2 Tons)(PPS-10W/15W/18W/20W) - Noveltek Industrial Manufacturing Inc. This stacker has front wide straddle, it can carry American closed pallets. This is a very safety machine. 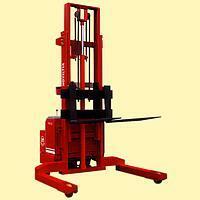 It is very usefully for in-door warehouse & industrial building. A 240AH/24V traction battery can be operated for 12 hours. The life time of this traction battery is 5 years. Body length is 855mm, it can be turned with-in 2.1 meter very narrow wide aisle. Straddle can go to out side of pallet, any width of straddle size can be produced to meet your market requirements. The drive wheel with suspension drive unit can be moved up and down by 45mm. The very short steering arm is very easy to drive. Chargers have 220V/40A, 220V/30A, and 110V/40A, 110V/30A for select.